If American history can truly be traced through the majority decisions in landmark Supreme Court cases, then what about the dissenting opinions? In issues of race, gender, privacy, workers’ rights, and more, would advances have been impeded or failures rectified if the dissenting opinions were in fact the majority opinions? In offering thirteen famous dissents—from Marbury v. Madison and Brown v. Board of Education to Griswold v. Connecticut and Lawrence v. Texas, each edited with the judges’ eloquence preserved—renowned Supreme Court scholar Mark Tushnet reminds us that court decisions are not pronouncements issued by the utterly objective, they are in fact political statements from highly intelligent but partisan people. 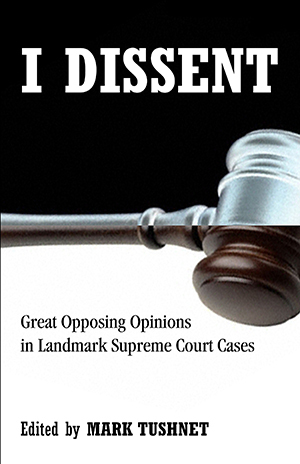 Tushnet introduces readers to the very concept of dissent in the courts and then provides useful context for each case, filling in gaps in the Court’s history and providing an overview of the issues at stake. After each case, he considers the impact the dissenting opinion would have had, if it had been the majority decision. Lively and accessible, I Dissent offers a radically fresh view of the judiciary in a collection that is essential reading for anyone interested in American history.